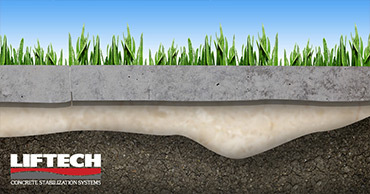 Improperly compacted soils experience settling and erosion and often causes large voids under overlying concrete structures. Heavy equipment and machinery can further weaken the substrate causing voids underneath the surface of the concrete as well. Often times these voids go unnoticed and the concrete ultimately fails and falls into the void below. Voids under porches and patios also provide an ideal home for mice, snakes, rabbits, skunks and animals of all kinds. Polyurethane is injected to fill these voids, support the overlying concrete and prevent future rodent intrusion. Do you need help preventing settling and rodent intrusion? Contact us for your free evaluation!